We met at Keith’s house for the March, 2009 installment of Analog Game Night. We started the night with five so after piling the games on the floor we had a special call to play I’m the Boss. I’ve only played once before at AGN Feb 2006 and had a lot of fun. Bob was very prepared to (re)teach us the game and I was surprised how quickly it all came back. In short order we were up and playing. We didn’t have quite the raucous deal making that we did our first game and it seemed to end rather abruptly but I still like the game enough to add it to my wishlist. It’s a bit pricing at $60-70 since it’s out of print so I’ll have to watch closely for a deal. Rich showed up just after finishing I’m the Boss and we broke into two, three-player games of Dominion. Using the randomization technique mentioned on BGG, I shuffled the deck of extra “blue” kingdom cards and drew 10 to seed the playing field. Both ends of the table played the same decks. The layout of the decks drove us to a quick finish in a race for money and Province cards. The other end of the table played a little slower but I think they were buying more action cards. 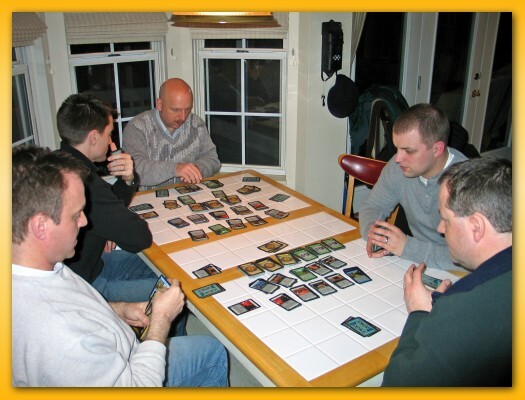 It’s interesting to see how the same decks of cards can be played by two groups in such completely different ways. If only I could use my experience to beat my wife. Man…she’s unbeatable! Thanks, Keith for hosting and see everybody next month.